Begin your holiday shopping early with Walmart’s exclusive Nintendo Switch bundle. The set will include the Neon Red/Blue Joy-Con controllers with the Switch console and digital copies of 1-2 Switch and Mario Tennis Aces. The package will run $359.99 and will hit stores on September 5, 2018. While we think Mario Tennis Aces is a great pack-in and a fun game, we really didn’t like 1-2 Switch (review here). Granted, some younger kids and a very casual audience might find enjoyment with that title, but it’s not exactly a must-have game by any means. We’re also not a huge fan of the games being digital downloads since the Switch has very little storage space to begin with. These games will effectively take up half of the memory out of the gate. Still, if you were planning on picking up Mario Tennis Aces anyway, this bundle could be for you. You get 1-2 Switch for free – we’re just not sure it’s worth the hassle. If you haven’t yet picked up a Nintendo Switch system or are looking to jump start your holiday shopping, Walmart has a great exclusive deal starting on Sept. 5. 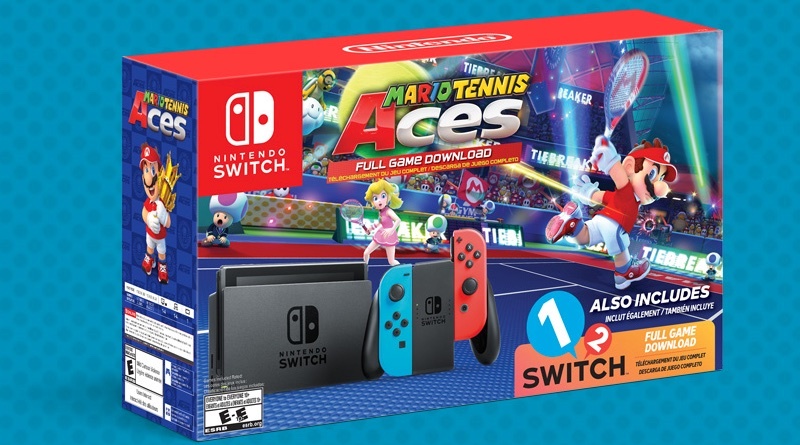 For a suggested retail price of only $359.99, you get the Nintendo Switch system and digital download codes for two great multiplayer games – Mario Tennis Aces and 1-2-Switch – providing hours of family-friendly fun. With Nintendo Switch, you can play games anytime, anywhere. In addition to Mario Tennis Aces and 1-2-Switch, the system is the home to critically acclaimed games like The Legend of Zelda: Breath of the Wild, Super Mario Odyssey and Splatoon 2, as well as popular franchises like Fortnite from Epic Games, EA SPORTS FIFA from Electronic Arts Inc. and Minecraft from Mojang AB. This holiday, three of Nintendo’s most popular series are coming to Nintendo Switch, with Super Mario Party, Super Smash Bros. Ultimate, Pokémon: Let’s Go, Pikachu! and Pokémon: Let’s Go, Eevee!